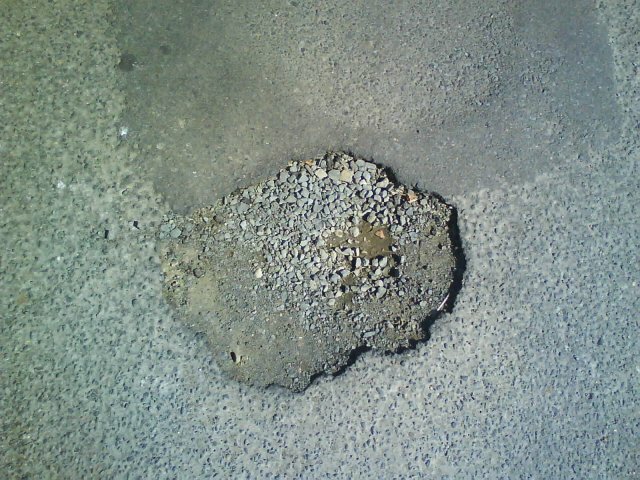 A pothole is a hole in a road pavement, frequently rounded in shape, resulting from the loss of pavement material under traffic. A pothole is created by the interaction between water and traffic. Inadequate drainage alongside the road shoulder can result in water entering underneath the pavement during prolonged periods of rain. This weakens the pavement's subsoil resulting in fatigue failure, or cracking, due to the flexing of the pavement under vehicular loading.These cracks in the pavement surface thereby provide another entry for water and exacerbate the weakening of the pavement's sub-layers.